The program of study leading to the Doctor of Musical Arts degree provides advanced professional, academic, and research preparation for music careers in teaching, performing, composing, and conducting. Major concentrations are offered in music education, performance, composition, and choral conducting. The School of Music should be contacted regarding applied music options available within the performance area. Admission. In addition to meeting the general requirements for graduate admission to the University, an applicant must present evidence of potential for significant scholarly, artistic, and professional attainment in his or her intended major area of concentration. Such potential is normally documented through an assessment of the applicant’s academic and professional background and standing; an audition; a portfolio review of musical compositions and performances; letters of recommendation; an interview; and other standard admission review procedures as appropriate to the intended major field of concentration. A recommendation for admission to the program from the School of Music must be approved by the dean of the Graduate School. Diagnostic Examinations. Diagnostic examinations are administered prior to or during the initial term of enrollment. Information concerning the diagnostic examinations is available from the Office of Graduate Studies, School of Music. Residence. The granting of this degree presupposes a minimum of three full years of study beyond the bachelor’s degree. 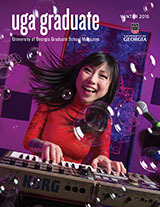 At least two consecutive semesters of full-time work (i.e., enrollment for a minimum of 20 hours of consecutive course work included on the program of study) must be spent in resident study on the campus of the University of Georgia. Undergraduate courses taken either to fulfill research skills requirements or to remove deficiencies may not be calculated in the 20 consecutive hours of resident credit. Time Limit. All requirements for the degree except the dissertation or document and final oral examination must be completed within a period of six years. This time requirement dates from the first registration for graduate courses on a student’s program of study.A candidate for the doctoral degree who fails to complete all degree requirements within five years after passing the comprehensive examination, and being admitted to candidacy, will be required to take the comprehensive examinations again and be admitted to candidacy a second time. Research Skills Requirements. The program of study requires research competencies appropriate to the elected major and minor fields of concentration. Research skills requirements will vary but may include such areas as statistics, computer science, music bibliography, diction, and foreign languages.A student electing voice performance as the major field of concentration is required to demonstrate a reading knowledge of two foreign languages selected from Italian, German, or French. A student electing a major in either voice performance or choral conducting must demonstrate competence in German, French, and Italian diction and pronunciation. For any other student, research skills are specified by the advisory committee as appropriate to the major or secondary field of concentration. Undergraduate course credit earned in the completion of language or other research skills requirements is not applicable to the minimum number of hours necessary for the awarding of the degree. Information concerning methods of satisfying research skills requirements may be obtained from the Office of Graduate Studies, School of Music. Advisory Committee. The graduate coordinator of the School of Music recommends an advisory committee to be appointed by the dean of the Graduate School during the student’s first year of enrollment. Included among the advisory committee are three faculty members representing the minor field of concentration and the areas of music history/literature and music theory. Provisional graduate faculty may serve in the same capacity as regular graduate faculty but cannot serve as chair or co-chair of the committee. Additional voting members may be appointed to the committee, including no more than one non-UGA faculty, who must hold the terminal degree in their field of study. If there are more than three members, there must be greater than 50% graduate faculty representation.The advisory committee, in consultation with the student, is charged with planning the student’s program of study, specifying research skills requirements, arranging for and administering the comprehensive examinations, approving the topic for the document or dissertation, approving and evaluating recital requirements, and approving the student’s defense of his or her research. Recommendations for advisory committee membership, and replacements should vacancies occur, must meet with the approval of the Graduate Studies Committee and the School of Music and the dean of the Graduate School. Programs of Study. The program of study involves the completion of course work in five areas: major field; minor field; music history/literature and theory; music in higher education; and research/special requirements. A preliminary program of study is normally developed during the first year of residence. The program must be approved by a majority of the advisory committee. The program of study should consist of 16 or more hours of 8000- and 9000-level courses in addition to research, dissertation writing, and directed study. No grade below C will be accepted on the program of study. To be eligible for graduation, a student must maintain a 3.0 (B) average on the graduate transcript and a 3.0 (B) average on the program of study.A final typed program of study will be submitted to the Graduate School prior to notification of the comprehensive examination. The program of study must be submitted on the proper form for approval by the advisory committee, the graduate coordinator, and the dean of the Graduate School. The final program of study must show all graduate courses relevant to the doctoral program including courses from the master’s degree, courses taken at other universities, and those courses taken in residence stipulated as satisfying minimum degree requirements within the stated matriculation areas. The program of study must carry a minimum of 30 hours of course work, three hours of which must be dissertation writing (9300). The department should evaluate carefully and fully each doctoral student’s progress and qualifications at the end of the first year of study in order to advise the student whether or not to continue in the program. Acceptance of Credit by Transfer. If graduate credit earned at an accredited institution constitutes a logical part of the student’s program, transfer of credit may be allowed when recommended by the student’s major professor, advisory committee, graduate coordinator, and when approved by the dean of the Graduate School. Such transfer of credit cannot exceed nine semester hours and must fall within the time limit of the degree. No grade below B may be transferred. The courses to be transferred may not have been used in a degree program at another institution. Transfer credit may not be used to satisfy the residency requirement. If the residency requirement has not been satisfied and the transfer course is taken during the Fall or Spring semester, a “break” in residency will occur unless the student is also registered at UGA. Transferred courses may not be included in the 16 hours of 8000- and 9000- level credit on the program of study. Transfer grades are not used in calculating cumulative averages. All requests for transfer credit, with accompanying official transcripts, must be in the Graduate School at least 30 days prior to the time the student plans to graduate. No courses taken prior to the student’s admission to their degree program at The University of Georgia are eligible for transfer. Comprehensive Examinations. The comprehensive examinations are designed to evaluate the student’s ability to assimilate and integrate knowledge, apply historical and theoretical concepts, demonstrate skills, and draw conclusions. The examinations, consisting of written and oral segments, may include a practicum, and are normally scheduled at or near the completion of course work. They cover doctoral course work completed in meeting the requirements of each cognate area of study for the degree, graduate work completed at the master’s level, and general musical knowledge acquired through independent study, research, and professional experience. The advisory committee prepares, administers, and evaluates the comprehensive examinations. The graduate coordinator reports the outcome to the dean of the Graduate School. To pass each examination, the agreement of the advisory committee is achieved with no more than one dissenting vote. An abstention is not an appropriate vote for the comprehensive examination. Successful completion of the written examination is a prerequisite for scheduling the oral comprehensive examination. All members of the student’s advisory committee must be present simultaneously for the oral examination and prospectus (proposal) presentation. The results of both examinations will be reported to the Graduate School within two weeks following the oral examination.An examination of the student’s dissertation prospectus may follow the oral comprehensive examination or be scheduled at a later date. The examination of the dissertation prospectus may not take the place of the oral comprehensive examination. The oral comprehensive examination is open to all members of the faculty and shall be announced by the Graduate School. The graduate coordinator notifies the Graduate School of the time and place of the oral examination at least two weeks prior to its administration. Dissertation/Document. A candidate electing music education as the major field of concentration must present a dissertation representing originality of research, independent thinking, scholarly ability, and technical mastery of the chosen topic of study. A candidate of performance, choral conducting, or composition is required to present a written document which, in conjunction with required recitals, is submitted in fulfillment of dissertation requirements. The document is more limited in scope than the dissertation, though comparable in scholarship and its contribution to existing knowledge in the field.The dissertation or document must demonstrate originality and scholarship; the conclusions must be quantified; the literary form must be consistent with normal standards for scholarly writing; and the contribution to knowledge must merit publication. A candidate whose major field of concentration is composition or conducting may elect a dissertation with the consent of the advisory committee. When composition is the major field, the dissertation or document normally will include one or more major original musical works. Scores as well as an accompanying analytical essay are required. Dissertation/Document Planning. The student is responsible for the development of a prospectus for the dissertation or document. The prospectus is developed with guidance provided by the major professor or designated chairman of the advisory committee. The advisory committee is to be consulted on a regular basis during the period of prospectus development. Approval of the prospectus requires the agreement of the advisory committee as evidenced by their signing an approval sheet attached to the final draft of the prospectus. This action signifies that members of the advisory committee believe that the prospectus proposes a satisfactory research study. A copy of the approved prospectus is filed with the graduate coordinator. Recitals. A minimum of three public recitals is required for a student whose major concentration is performance. A student with a concentration in composition is required to present two public recitals. Four recital performances are required of a student majoring with a concentration in choral conducting and literature. Programs for all recitals and performances must be approved two months in advance by the major professor and advisory committee. When a lecture-recital is to be given, an outline of the lecture must accompany the program proposal.The first full recital must be presented prior to scheduling the written comprehensive examination; the last recital may not be scheduled until the oral comprehensive examination has been satisfactorily completed and degree candidacy established. Recital projects presented in partial fulfillment of degree requirements will be evaluated by the full membership of the advisory committee. The committee will notify the major professor if the recital presentation is approved. Should the committee decline approval, the major professor and the dean of the Graduate School are so notified. The graduate coordinator of the School of Music, or an approved designate, will be responsible for coordinating the evaluation of recital project presentations. After admission to candidacy, a student must register for a combined total of ten hours of dissertation or other appropriate graduate credit during the completion of the degree program. Students planning to graduate the same semester they enter candidacy must be admitted to candidacy by the published deadline for candidacy during that semester and register for ten hours. The student must also meet all other deadlines for graduation in that semester. The student must register for a minimum of three hours of credit in any semester when using University facilities, and/or faculty or staff time. Once a student has been admitted to candidacy, the department has an ethical responsibility to ensure that appropriate faculty mentorship is provided to the candidate for completion of the degree. Dissertation Approval and Defense. When the major professor is satisfied with the completed dissertation, he or she will certify that it has his or her approval and is ready to be read. The major professor will then distribute copies of the dissertation to the remaining members of the advisory committee and schedule a final oral defense. The graduate coordinator must notify the Graduate School at least two weeks prior to the defense. Subsequently, the Graduate School will announce the time and place of the defense of the dissertation to the University community. The committee members must have three weeks to read and evaluate the completed dissertation.Written assent of the committee members (other than the major professor) will be required before a dissertation will be approved as ready for a final defense. No more than one dissenting vote may be allowed for the approval of the dissertation. If the advisory committee declines to approve the dissertation as ready for the final defense, the major professor will notify the student and the Graduate School. The defense of the dissertation or document will be chaired by the student’s major professor and attended by all members of the advisory committee simultaneously for the entire examination period. It is open to all members of the University community. The advisory committee must approve the student’s dissertation or document and defense with no more than one dissenting vote and must certify their approval in writing. An abstention is not an appropriate vote for the final defense. The results of the defense of the dissertation or document must be reported to the Graduate School at least two weeks prior to graduation for the current semester. Once the dissertation has been approved by the advisory committee and the final oral examination has been passed, the dissertation must be submitted to the Graduate School for final approval no later than two weeks prior to graduation of the following semester. Dissertations which are not submitted by this deadline must be defended again and approved by the advisory committee before they will be considered by the Graduate School for final approval. Submitting the Dissertation. One complete formatted copy of the dissertation must be electronically submitted to the Graduate School for a format check no later than four weeks prior to graduation.The Graduate School must receive the Final Defense Approval form and an electronic submission of the corrected dissertation no later than two weeks prior to graduation. This official copy of the dissertation will be electronically submitted by the Graduate School to the main library for archiving. A graduate student may not submit a dissertation to the Graduate School for format checking or the dean’s approval between the last day of classes and late registration of the following term. All requirements for the degree must be completed and reported to the Graduate School no later than one week prior to graduation. A student must be registered for a minimum of three hours of credit the semester in which all degree requirements are completed unless additional stipulations are required by other units of the university.